No fiber stuff to share right now, so I’ve got drawings. I’m trying to spend more time drawing since I see it as a bridge between crafty me and artist me. Not that drawing is crafty. It’s just that I see myself as primarily a craftswoman and needleworker, but I can draw as well. So, since “real” artists draw, when I draw I feel more in touch with the artist I want to be. We took my visiting mom and step-dad out to lunch today at a brewery restaurant that is filled with bears and bucks and pheasants and such. I brought my sketchbook and drew the bear watching over us. The rest of the drawings are from the life drawing sessions that I try to attend weekly, so if you are uncomfortable with male and female nudes, don’t scroll beyond the bear. Dad, I know you love my drawings so scroll to your heart’s content. Playing around in one of my sketchbooks. I don’t like what I did to her hip area so I have subsequently painted over it and added some other design elements. I haven’t bothered to photograph it yet because I think it’s still missing something. I tried these without lifting the pen/pencil. The first/black one turned out best. The pose of that day. Lots of inherent energy in the pose. Not sure it’s in my drawing. As soon as the model struck his pose, I saw this as the companion to the next drawing which I had done and posted a month earlier. I’ve recently been invited to join the bloggers at The Sketchbook Challenge. You can now find me over there at least once a month. The blog is inspired by Sue Bleiweiss’s book of the same name, and encourages readers to work in a sketchbook as often and in as many ways as possible. There is no one “right” way to use a sketchbook and the variety of contributors is intended to demonstrate that. November’s theme is an autumnal Spice of Life. I wrote about creating a new sketchbook with spice colored pages. Recently, my friend Terry blogged about gathering and preserving Fall leaves. Serendipitously, my family and I had just been out hiking and gathering our own autumn leaves, which I used in my spiffy book. I traced each different kind of leaf we collected, overlapping them as I went. Then I used a black pen, two brown markers, and a white charcoal pencil (because I can’t find my opaque white pen) and filled in the sections doodle-style. Looking back at the November SC posts, I see that not only did Terry post about leaves, but Frances posted about Zentangles which are essentially the same idea of filling in shapes with patterns. I love it when things all come together! We’ve had a string of visitors since we’ve moved here: my mom in July, my dad in October, my Mother, Brother, and Sister in Law in early November, and my mom and Step Dad are here right now (we’re looking forward to two more visitors in January too). With all these people, we’ve been exploring the city but have been too busy to blog about it. 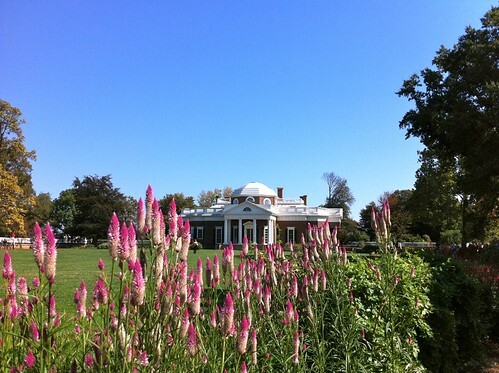 So, here’s a collection of Thomas Jefferson inspired photos from our explorations of the University of Virginia and Monticello, both of which he designed. 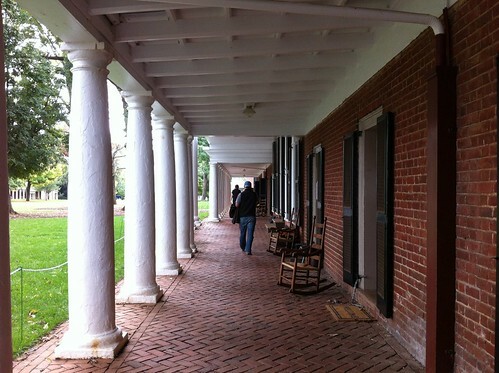 I love these serpentine walls. 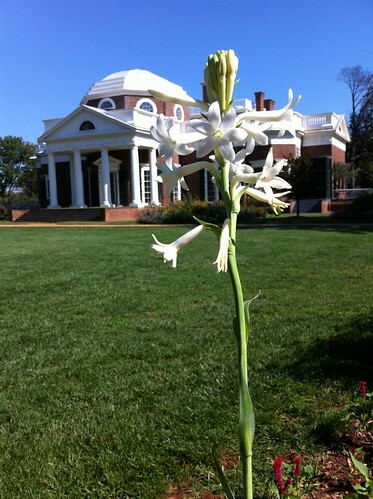 Very Jeffersonian. 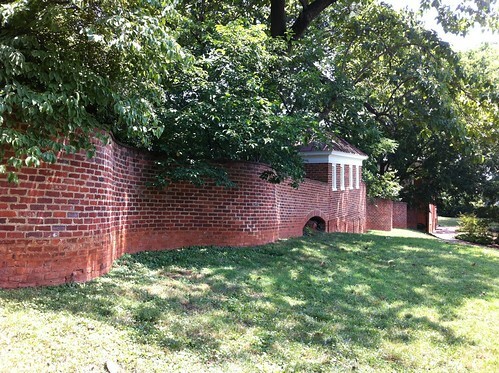 He has enamored of this type of wall because it was economical to build being only one brick thick, but very stable because of the undulating shape. There’s a house on the way downtown that has a stone version of this which I absolutely love. 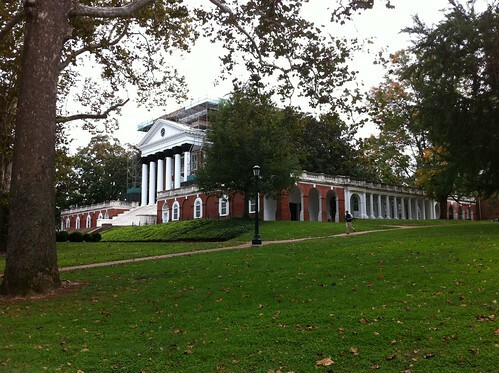 UVA student dorm rooms and “pavilion” office/residences. 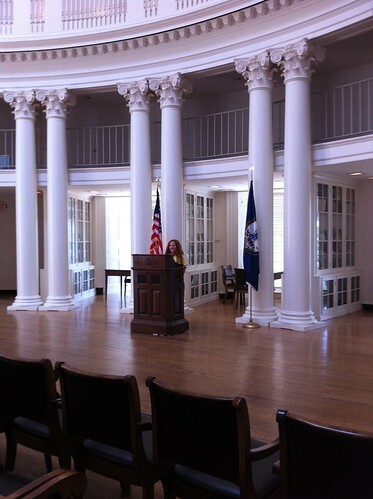 Inside the Rotunda at UVA.